My chickpea miso is ready!! I’ve been so good about not diving into the jars— I’ve waited so patiently to harvest my one and two-year-old misos. As it aged it developed deep caramel tones and a very complex, smokey umami flavor. There are many brands available in Asian grocery stores, but I prefer to make my own for purity and proper fermentation method— rice koji, chickpeas and sea salt are the only ingredients in authentic miso. Some brands rush the aging process by over-blending and adding sugar and alcohol; some commercial brands are even frozen which is a huge NO NO. Chickpeas make a subtle, sweeter miso; it’s ideal for people who exclude soy from their diet. If you’re interested in learning more about this fermentation process, here are instructions for making miso on my blog: Making Miso 101. So now that my miso is ready what do I do with it? Miso is one of my favorite ingredients— I use it in stews, soups, marinades and even peanut brittle candy. 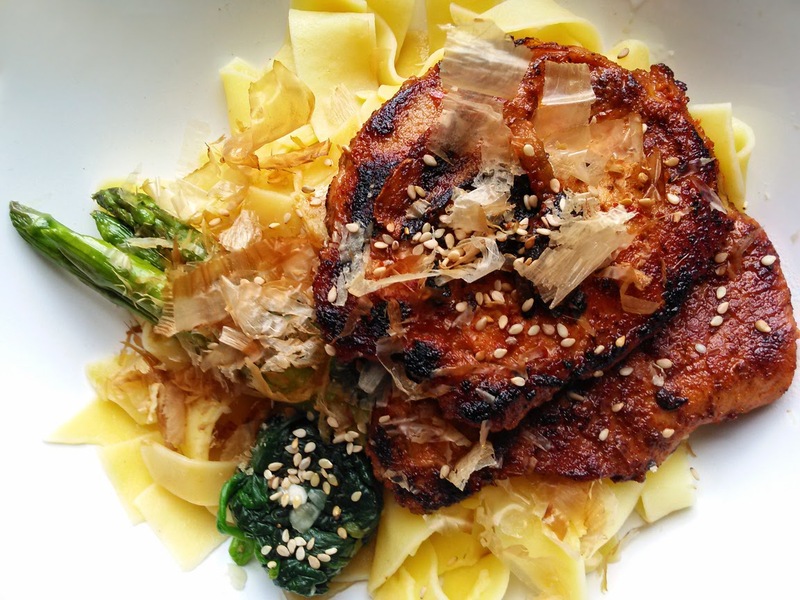 Here’s a simple pan-seared pork chops recipe using miso, whiskey and Korean chili paste as a marinade. Using a teaspoon, run miso through a fine sieve to refine any clumps. Prepare ginger with a microplane grater to get a fine grade. In a mixing bowl add all ingredients except for the chops and onion; mix until the brown sugar is dissolved. Toss pork chops and sliced onion with marinade, coating chops evenly. 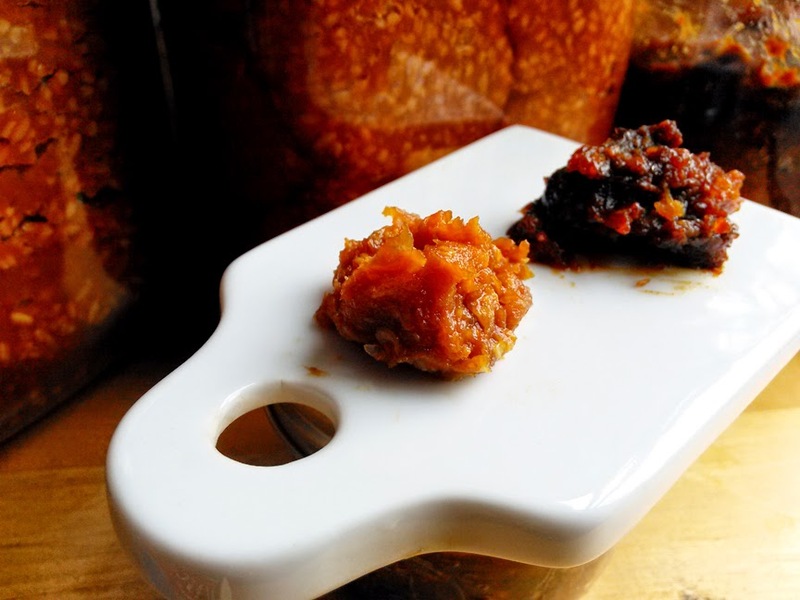 Place in a closed container and marinate in the refrigerator for at least four hours— overnight is ideal. It’s fryin’ time! In the sink, place marinated pork chops on a slanted chopping board for 10 minutes to drain some of the liquid. Heat skillet on a high and add oil. Lower flame to medium when the oil reaches smoke point. A well-seasoned cast iron skillet would be ideal, but a non-stick pan with a thick bottom works well too. Sear chops for four to five minutes on each side or until they caramelize. Remove from pan and set aside to rest for five minutes before serving. Sprinkle with toasted sesame seeds and Japanese katsuoboshi (shaved bonito flakes). Hello Kimcheelicious (aka TL, ja ja ja), I'm decreasing salt in my diet. Is there such thing as a low salt or no salt kimchee and/or miso? Or is that an oxymoron? The Gluten-free EeatUP! One-year Anniversary! !